Battle of Baltimore first: Registrations for BoB18 are closed. The event is full. If you are interested in being on the waitlist, please click here. We wish all 30 registered teams good luck and know they will have an awesome event! On to Education Day: Pre-Registrations for Education Day 2018 are open! As with last year, we are taking pre-registrations and pre-payment to make check-in at the event smoother. Check out the Education Day main page and register to attend! Battle o’ Baltimore Registration Open! First, there is only about a week until our first Summer Seminar! We can’t wait to see everyone over coffee! Second, and I know you have been chomping at the bit for this, Registration for Battle o’ Baltimore is open! Woohoo! About one month left to register for our Summer Seminar! Get Ready for BoB 2018! The Battle O Baltimore 2018 will be held on Saturday, September 22nd 2018 at the McDonogh School in Owings Mills, MD. Be sure to watch this space for more details as they develop. 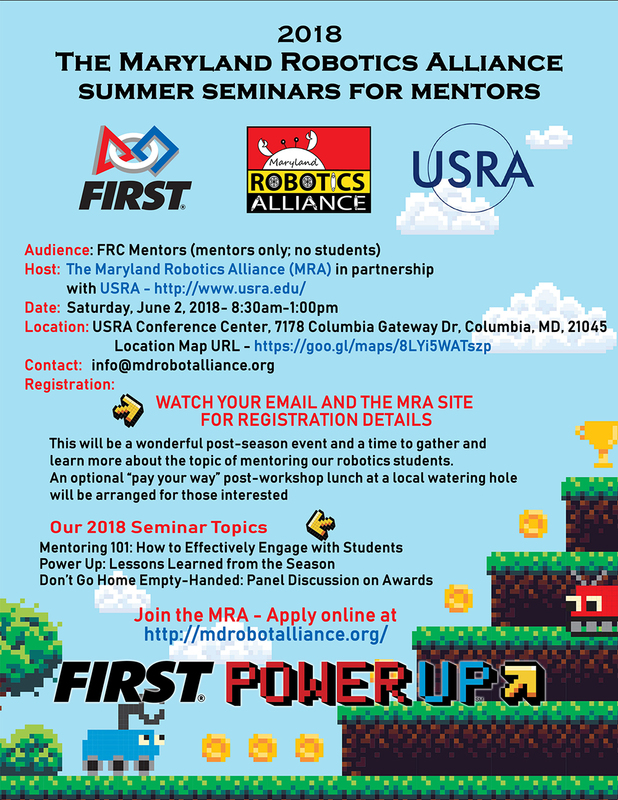 Get your calendars out and reserve Saturday June2, 2018 for the first MRA Summer Seminar for Mentors. The session will run from 8:30AM to 1:00PM at the USRA Center in Columbia, MD. There will be a get together after the event at a local establishment for anyone interested. Register now from the Events menu!